Pink | Wedding Shoes by Pink | Bridal Shoes by Pink from Arabesque. Pink by Paradox London - affordable and fashionable bridal & occasion shoes. 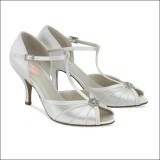 Buy online with express delivery from Arabesque, the UK's leading bridal shoe & accessory retailer.